My tenure as a staff writer at GQ back in the ’90s took a fatal hit when I was assigned to do a short piece about John Lobb, the storied British shoemaking firm. Reeling from boredom at the prose I was turning out, I switched to verse. This was published to much grumbling from the editor-in-chief. It was one of our last conversations in fact. But the boy was determined to cobble. A lad with a limp and a quest. His dreams of becoming the best. 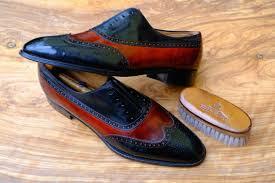 John Lobb thought he’d try his luck too. He found thieves, he found cholera. So he opened a bootmaker’s shop. Those boots! What a hit! They were sturdy, they fit. His booty (if that’s the expression). And dress boots for the Prince of Wales. Of London’s elite to accouter. Have made Lobb’s the world’s most renowned booter. Of the best in affaires des pieds. Yet another examines the whole…. And take that inaugural stroll. These shoes practically teach you to dance. In rhythmic retreat and advance. Many other great men in their time. All famous — but none of them rhyme. While those craftsmen continue to cobble. If one firm can combat all that, Lobb’ll.